I'm on vacation. I asked for some guests to fill in the holes while away, and PJ stepped up to the plate. Besides beer, you may find PJ chatting about Syracuse Basketball (which is balanced by an awesome healthy dose of anti-Duke sentiments) and the quality of many recognizable PSA's. Thanks a lot. Many thanks to Rob for allowing me to guest review on the blog this week! I'm not as experienced at these reviews as he is, but I am an alco--, I mean an avid beer drinker, so I hope I'm credentialed for this. Since I have a few new brews I've been looking forward to trying out, now was the perfect time to get to it. 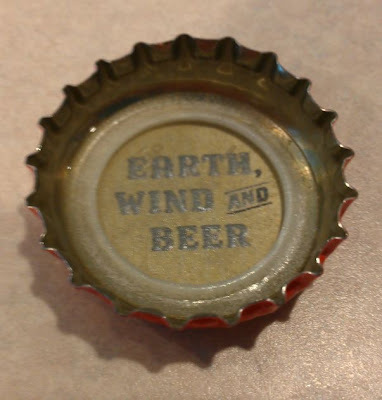 Uinta ("Earth, Wind, and Beer") is a brewery that has not quite made its way into my regular rotation, despite a lot of their brews being well-liked and highly rated. So, I never really think of them when looking for new stuff. 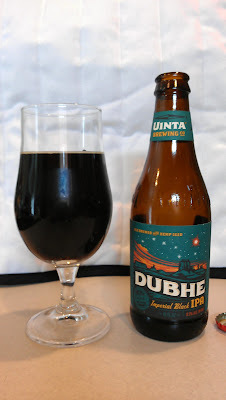 But when I went into my local shop, and asked for ideas on some good new stock, the clerk pointed me in the direction of Uinta's Dubhe Imperial Black IPA. She raved about it and said it was a really great beer and was pretty popular. So, I gave it a whirl. I picked up a 4-pack of 12s, for $9.40 + tax. 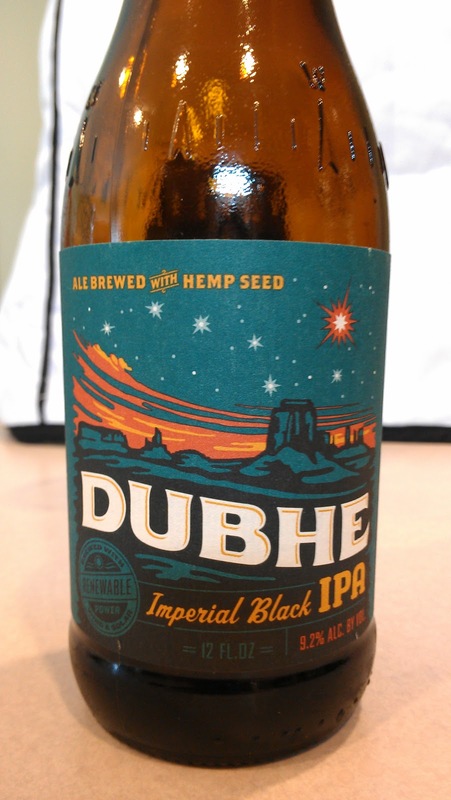 By Uinta's own explanation: "Named Utah's Centennial Star in 1996, Dubhe (pronounced Doo-bee) illuminates the front of the big dipper from 124 light years away. Dubhe, also known as Alpha Ursae Majoris, is a red giant that appears orange in color and has a mass 4x that of the sun." The bottle depicts a Utah mountainscape with a bright star, and its description: "Ale brewed with hemp seed." Dubhe is a year-round beer in their Classic line. I chose to pour into a tulip, though Uinta recommends a standard pint glass. It pours beautifully, a deep black, but with some ruby hints when held to the light - which makes sense for a beer named after a red/orange star. The head is great, foams to a pale tan and leaves behind some moderate lacing. Aroma is an earthy, resin nose, with an obvious toasted quality. Medium body, medium carbonation are just perfect. The taste is exactly what you'd expect. The very first taste I get is a citrusy hop, followed up with a roasted bittersweet coffee sensation. The malts hit you on the back end and it finishes nicely with a great dry bitterness. The wonderful thing about this beer is that it is so cohesive and balanced. At the same time it is both uniquely earthly and green/floral and a smooth, roasted, coffee malt. To be honest, I have no idea what hemp seed tastes like, or is supposed to taste like, but I imagine it's what gives this beer its rich earthly quality that works so well with the hops. At 9.2% ABV, this beer goes down quite smoothly and definitely does not have any of that hot alcohol sensation. I couldn't be happier with this brew. Whatever name you want to call it, black IPAs/black ales are becoming more common these days. For those skeptical of the genre (the name itself being an oxymoron), definitely give this one a try. It's a great beer that anyone should be happy with. I rank it up there with Stone's 15th Anniversary Escondidian Black IPA as my favorites in the style.